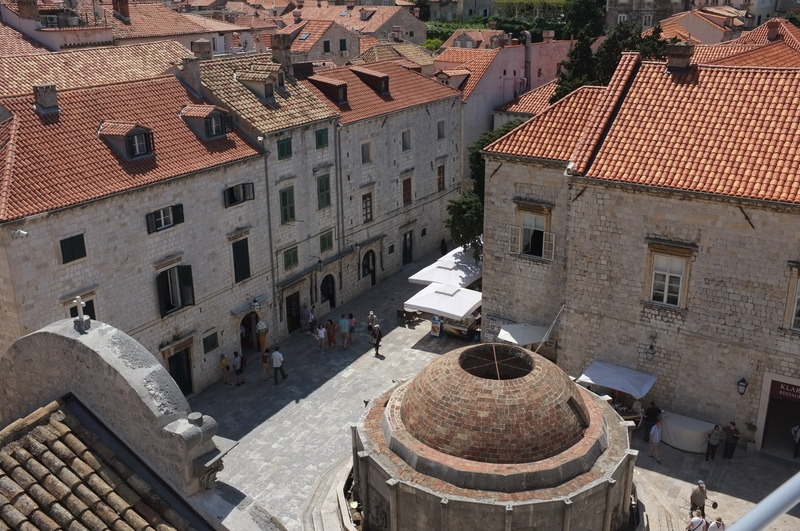 I have a good look at the Dubrovnik old city using Google Earth. It gives a bird’s eye view of the city and I can zoom onto any part of it, demanding a street view or some detail information about the places of interest. I happily re-lived my journey using this wonderful tool. While I am happy with what I find; I also notice that there are not much of vegetation or large open spaces within the old town. Even from a mile up above the city, the whole city seems to be orange color- from the orange colored roofs jam packed together. 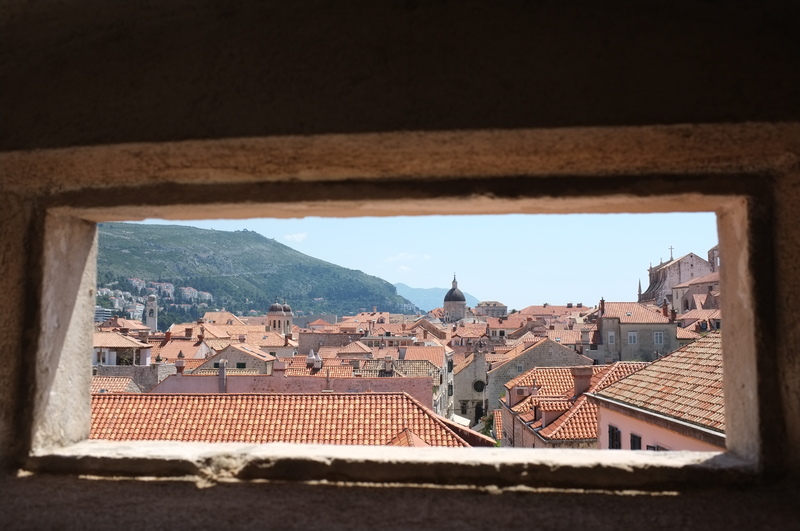 My trip up the hill Srjd behind the city also confirmed this (see my previous post of Dubrovnik – From a Distance). 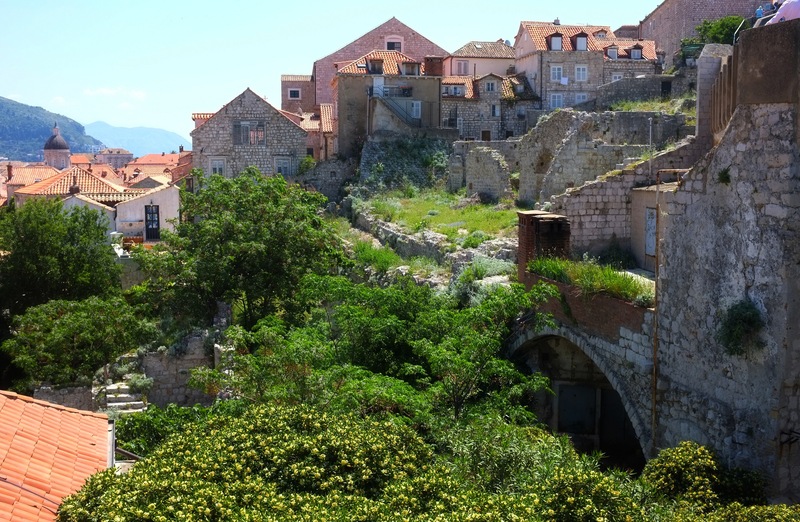 I guess that in the past many people wanted protection within the four sided castle walls and fortifications of Dubrovnik. Most open spaces are ultimately utilized for housing people within the confines of the wall. The city finally could not longer grow organically within the confines of the walls ; the city was left with that compressed feel as common for other former capitals such as Toledo, Spain. The place is built up and gives one the impression of being “hard”. As Jan Morris in her “The Venetian Empire” describes it as . . . . “A hard city it remains too, to my mind, when you cross the bay and land upon its quay, beneath its high fortifications. It is very beautiful but hard. It lacks the yield or leniency of Venice. Built of a glittering and impermeable marble, enclosed within superb city walls, tilted slightly with the lie of the land and corrugated everywhere with battlements – tightly packed there within itself it has acquired non of the give-and-take of great age, but seems in a way a perfectly modern place, dogmatically planned and didactically displayed to visitors, like a model town in a trade fair.” Indeed, it is a city in which residents have to live under the eyes of tourists all year round. 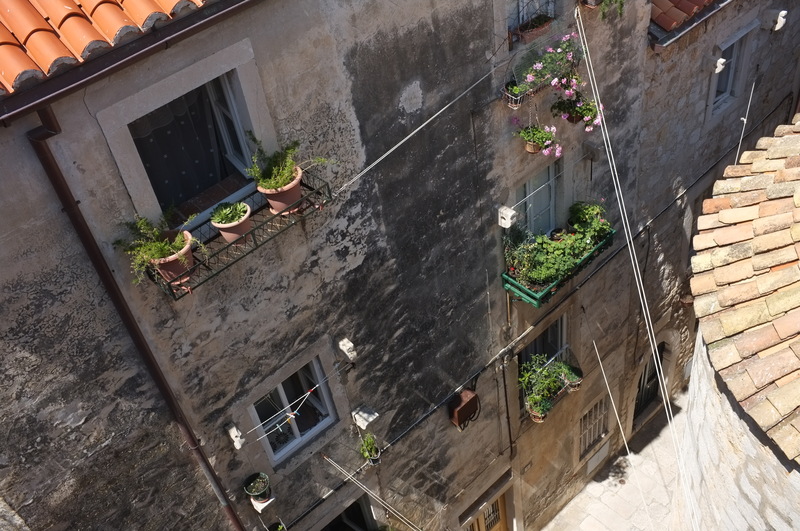 Here is that street today called Stradun. Once the left side was the edge of the mainland and the right was an island, separated by a waterway. 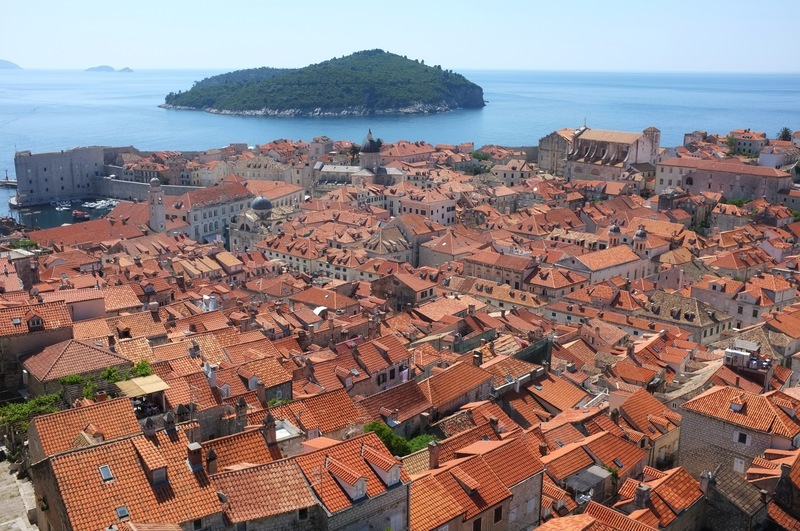 In the Roman days, they were developed into two towns, the one on the right of Stradun was known as Ragusa and the left the Slavic Dubrovnik. An extraordinary feat of 12th century civil engineering filled in the water channel and left space for the long Stradun and the wide expanse in front of the Rector’s palace. This is the only wide street in the ancient city where every tourist have strolled admiring at the historical buildings and churches. Nearby is the Big Onofrio Fountain. It’s a 16-sided water fountain and is considered a masterpiece of engineering for the early 1400’s. Water fills the basin that surrounds this domed structure through spouts at the center of the decorated emblems. The water that serves it is 20 kilometers away. While walking on the high walls, we found ourself walking close to residential buildings. Some of the houses were destroyed in the civil war of the 1990s and were left there untouched. Sometimes we are viewing the backyard of people’s houses. The sun is our best device for drying up clothes. 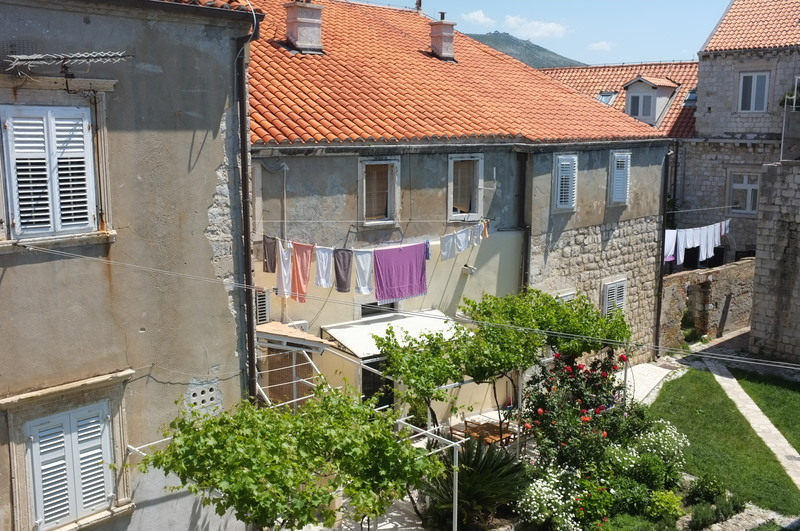 In our several days here, we never fall short of finding examples where clothes and bed sheets were hung from the windows. . 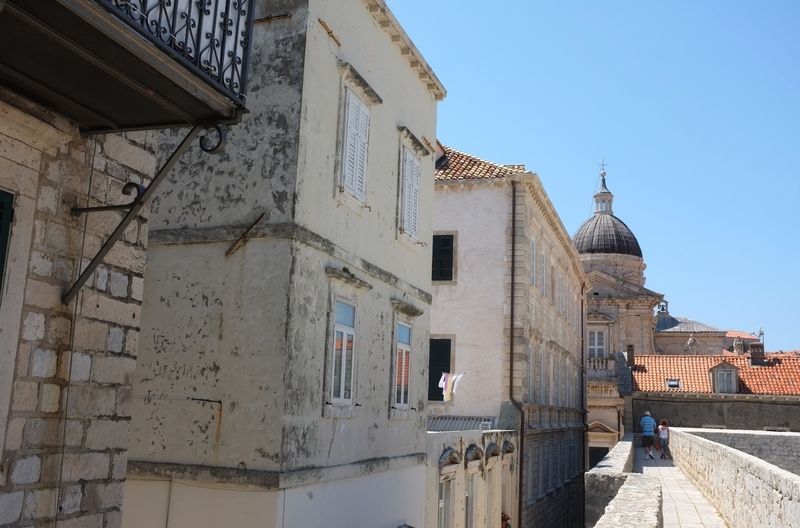 Although the old town is densely built up, it still has a lot of charms and beauty and the views from the Dubrovnik seawalls were just breathtaking. 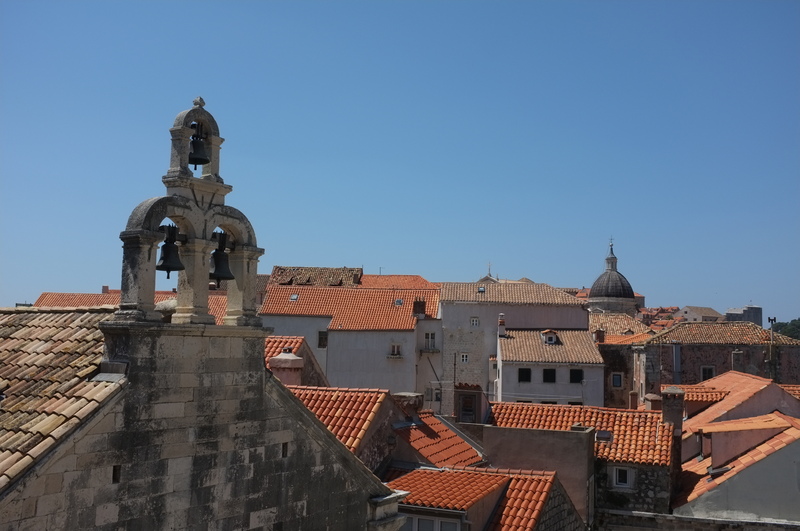 In our several days in Dubrovnik, it was hot and the temperatures were almost up to 30 degrees. We passed by this roadside cafe which sold drinks and fruits and decided to take a rest here. 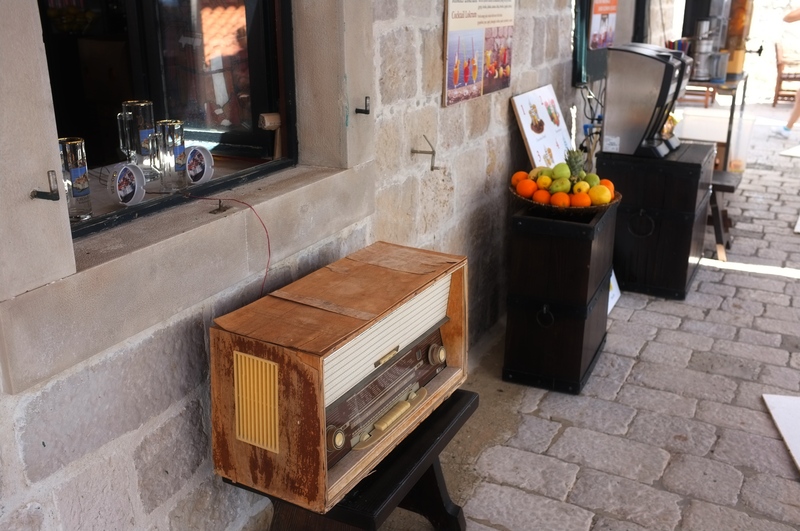 The vintage radio reminded us that we were back in time. . . . . . . . . . . . It was already dark when we walked down the street of cobble stones, with tall stone walls like canyon on both sides. 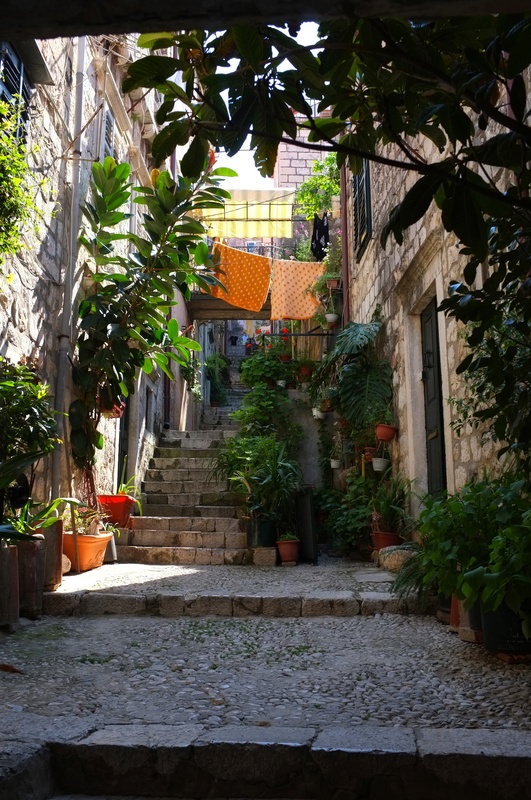 We wandered alone down deserted streets and alleys of the Dubrovnik old town. 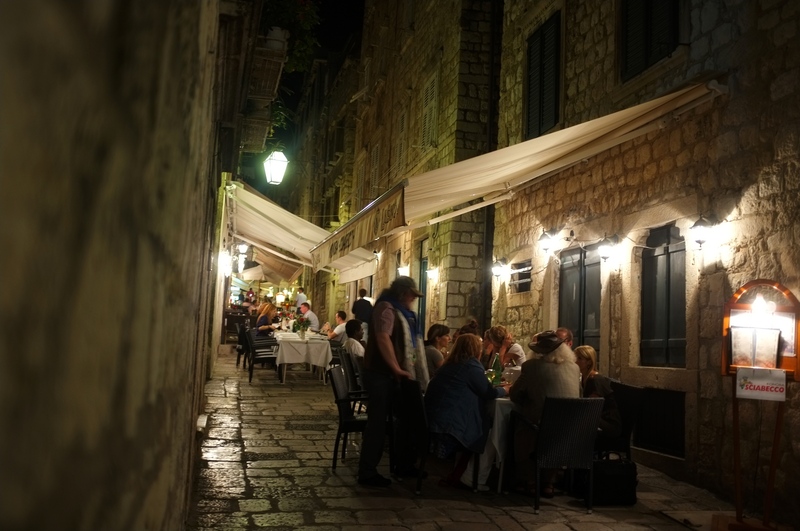 We discovered the best time for a stroll through Dubrovnik’s Old Town is after dark. We passed by deserted shop windows which looked very different at day time. 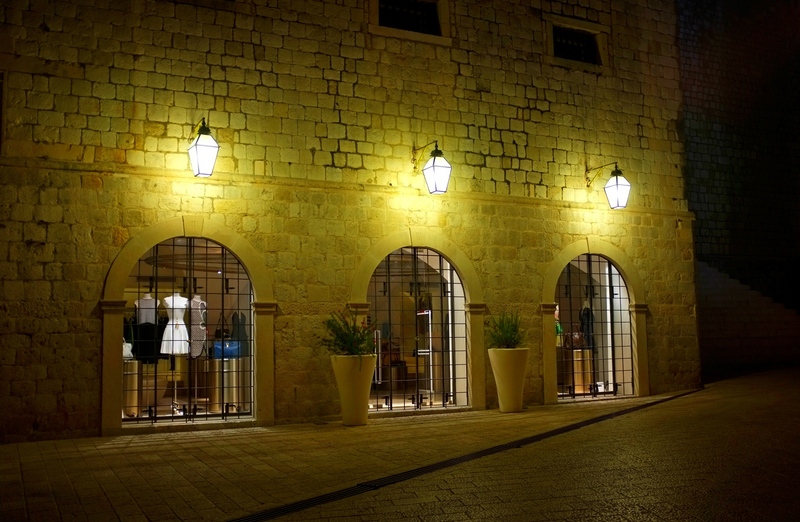 The Dubrovnik old town at night is as beautiful as it is during the day. 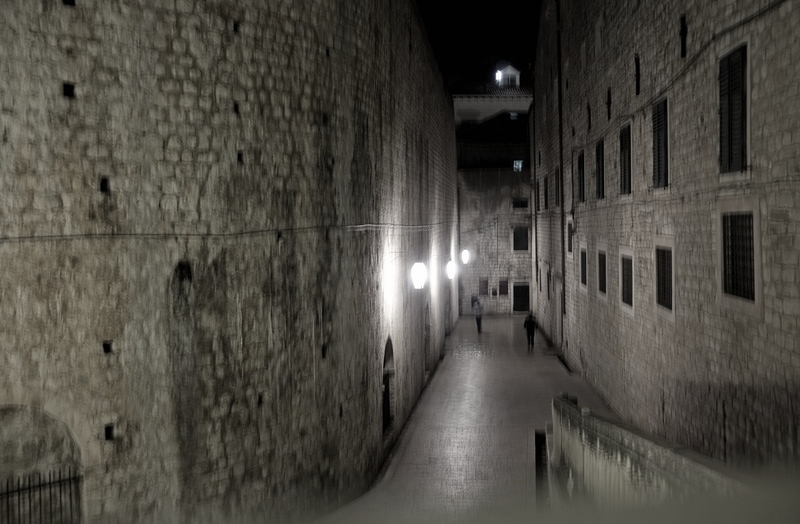 We glided down Dubrovnik’s main street, the Stradun and strolled past churches and shops closed up tight for the night. 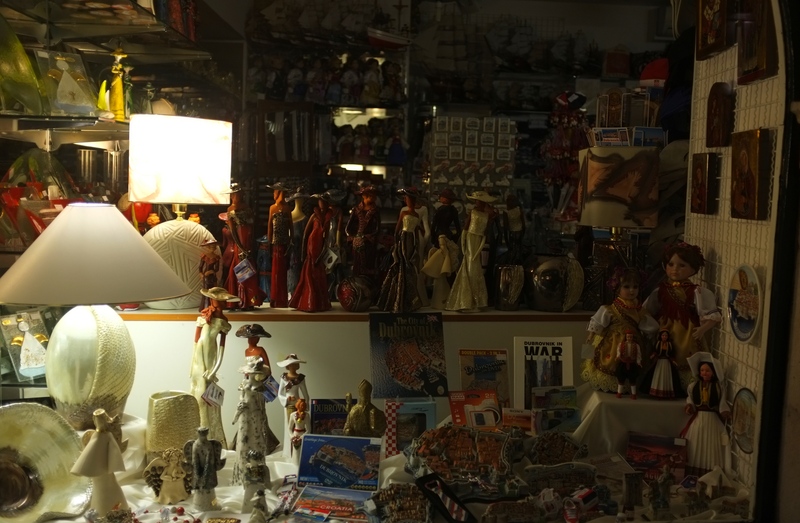 The shop windows were very appealing. 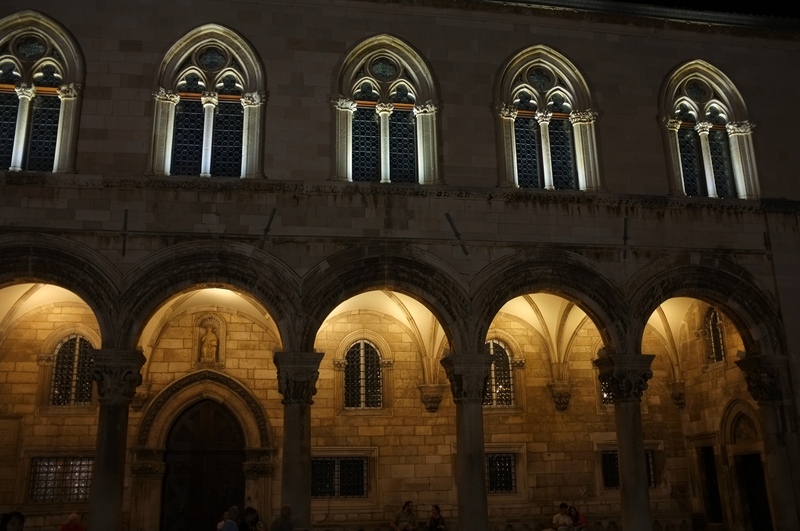 As we reached the end of the Stradun, we turned to the square on our right and discovered this elegant Rector’s Palace which was the seat of power in the old city-state of Dubrovnik. 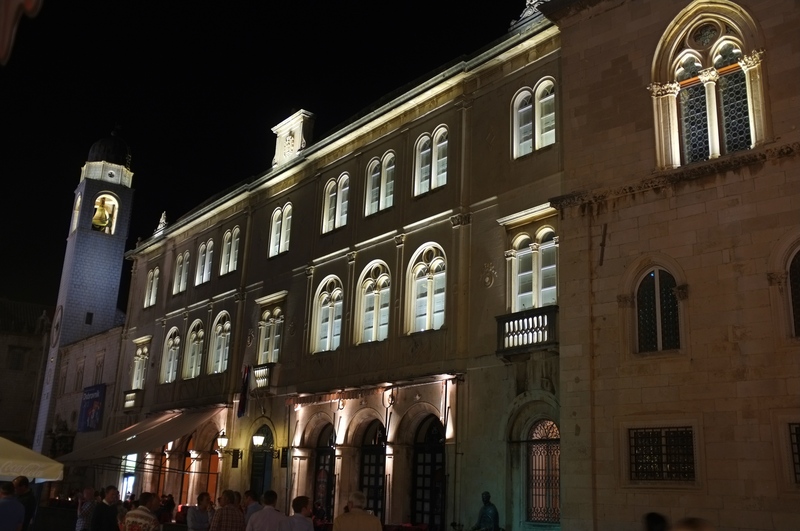 This beautiful building is a harmonious mixture of Gothic, Renaissance and Baroque elements. The original palace was modeled after the Roman imperial palace, with some influences from Venetian palaces. There were two gun powder explosions in the 15th century and an earthquake in the 17th century which destroyed part of the palace. The existing building was rebuilt at the end of the 17th century. The central portico features beautiful archways and a second story mezzanine. The most beautiful part is the portico with the open ceiling and archways. Further stroll brought us to the nearby beautiful Luza square where we found the Church of St. Blaise, who is Dubrovnik’s patron saint. St. Blaise was also the protector of the Independent Republic of Ragusa. 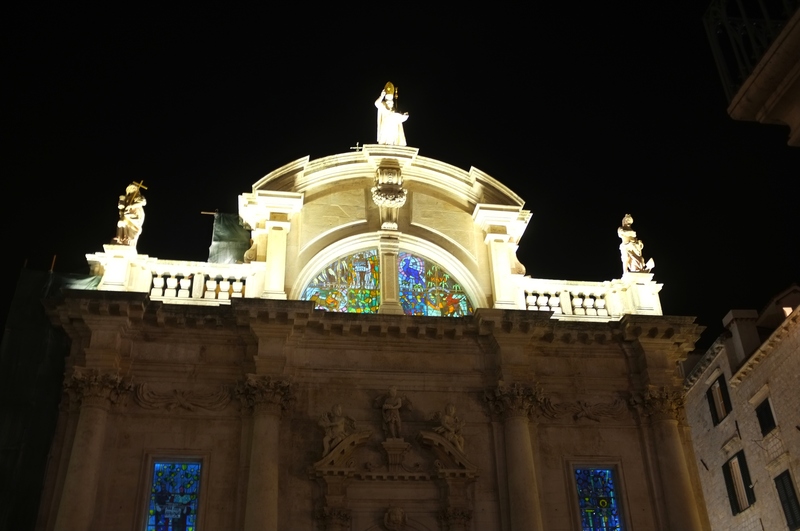 The church is easily recognizable by the statue of the city’s patron, St. Blaise on its top! 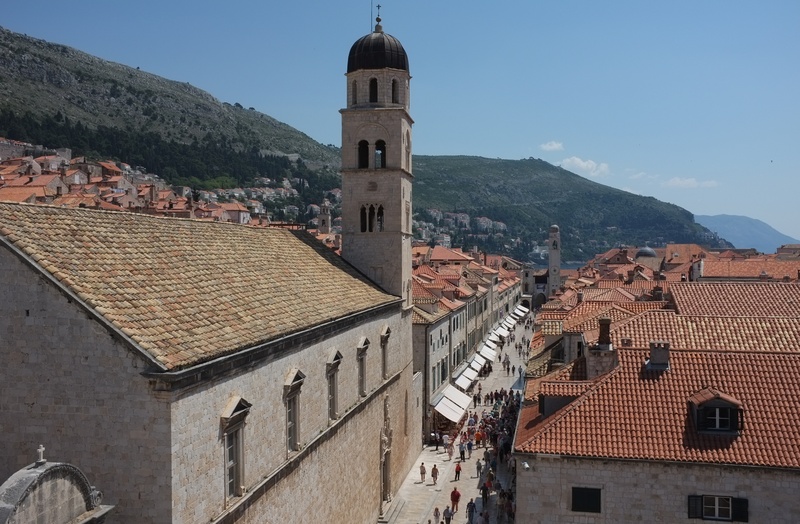 This 18th century Baroque church is one of the most recognizable Dubrovnik attractions. Our empty stomachs reminded that we still did not have our dinner yet and we should be looking for a suitable restaurant. This restaurant by the side of the alley looked inviting but at this time of the night, it was all full. 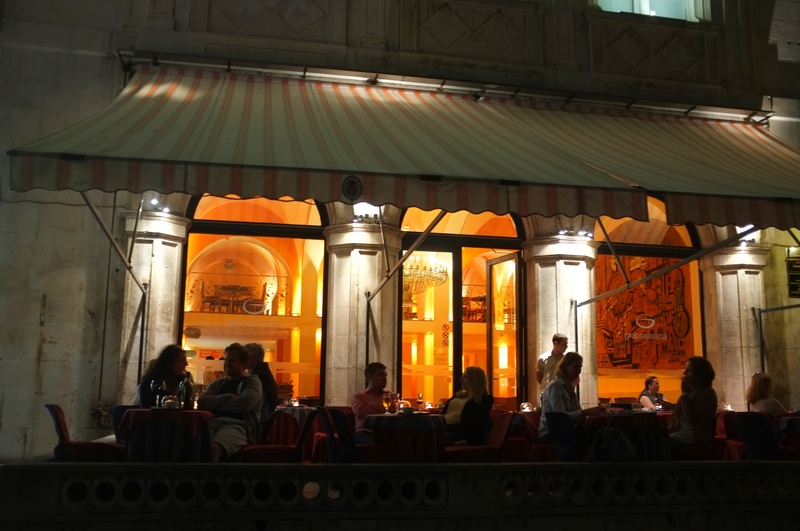 This restaurant really looked nice and it was blissful just to sit here and have alfresco dinning while gazing at the beautiful buildings nearby with the nights on. 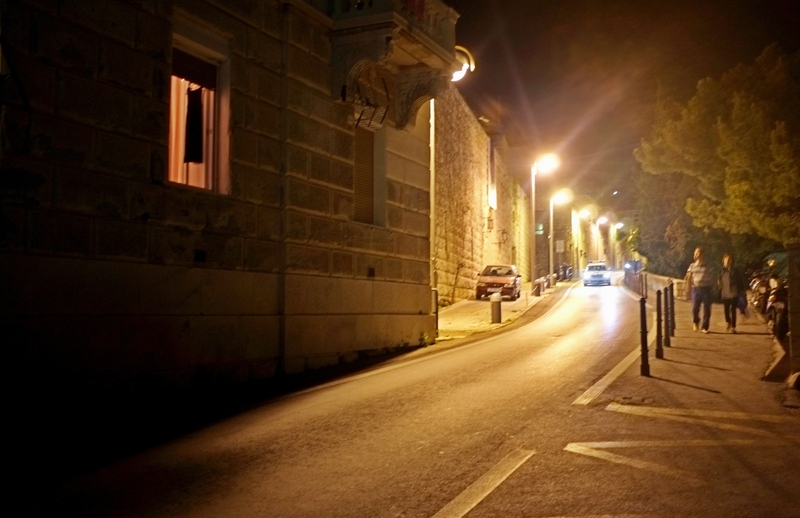 After dinner, we walked our way back to the hotel along the hilly driveway with roadside lights guiding our way. . When we reached our hotel. 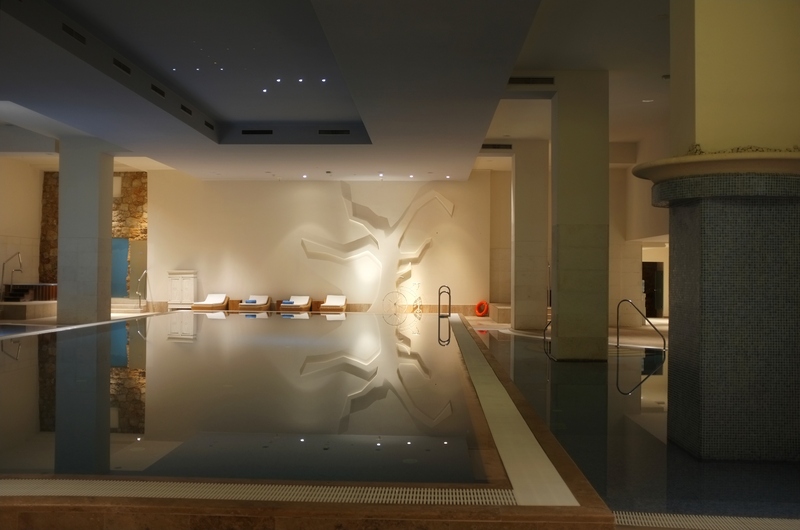 it was already late and we collapsed onto the comfortable seats by the pool while others opted for an evening swim. We were happy that we were given another fine and blissful day and an enjoyable evening!